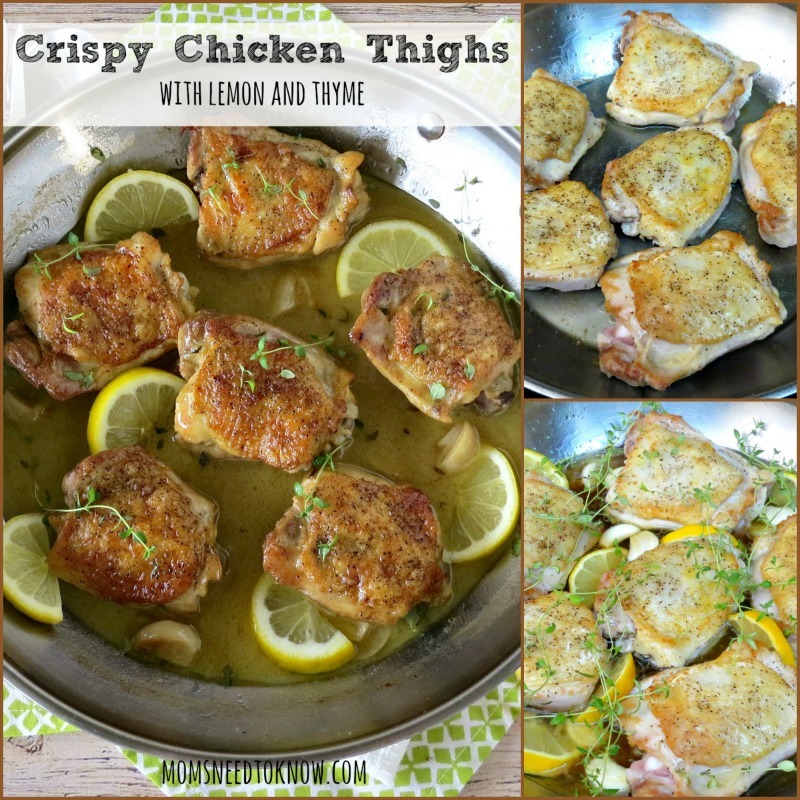 Lemon, thyme and butter make these crispy chicken thighs so moist and flavorful. Start them on the stove and finish them in the oven! If there is one thing that you should have figured out about me by now, it that I like simple recipes that are full of flavor…and that chicken is really my favorite protein. I've also made no secret of the fact that I am not a big fan of chicken skin, but my family loves it and cooking chicken with the skin will on is a great way to seal in much of the flavor and moisture. These crispy chicken thighs are a nice compromise between my family and I (I just remove the skin before eating, but they gobble it up)! As fancy as this looks, this is a quick and easy way to prepare chicken thighs. Browning them on the stove before baking them in the oven creates a gorgeous, crispy skin. 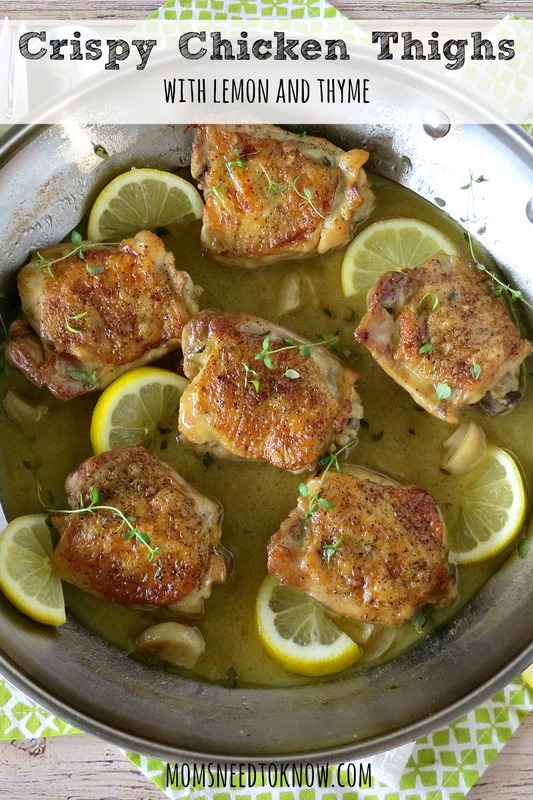 Lemon and thyme go so well together and create a sauce that is just bursting with flavor! Finishing with a little butter at the end adds richness and body to the sauce. I've even been known to substitute some dry white wine (like a chardonnay) for some of the chicken stock for even more flavor! The garlic will get very soft and spreadable, so I usually serve this with toasted baguette slices to spread the garlic (although it would be even better served with my roasted red peppers with baguette slices – have you figured out that I am a fan of baguettes yet?). Once you have this cooking technique down, you can really play around with the flavors. You can change up the seasonings, herbs, and citrus to create endless variations. The stems of the thyme are tough, so you'll definitely want to remove them after baking. To remove only the leaves, hold the sprig of thyme at the top, and then use your other hand to strip off the leaves moving from the top to bottom. They come off very easily! Cut one lemon into half-moon shaped slices, and juice the other. Set aside. Sprinkle the chicken thighs with salt and pepper and set aside. Place a large, oven-safe skillet on the stove over medium-high heat. When the pan is hot, add the olive oil. Place the chicken thighs in the pan with the skin side down, and don't touch them for 30 to 40 seconds. Wiggle the chicken to release it from the bottom of the pan. If it doesn't easily release, let it cook a little longer. Rotate and turn the chicken every 30 seconds, but don't flip it yet. Rotating it around helps it evenly brown. This process should take 3 to 4 minutes. Turn the chicken thighs over and pour the chicken broth into the bottom of the pan to deglaze. Sprinkle the garlic cloves all around the pan and tuck six lemon slices around the chicken. Separate the sprigs of thyme and nestle them all around the pan, in between, and on top of the chicken. Place the pan in the oven and bake for 30 to 35 minutes or until the internal temperature of the chicken is 165°F. Remove the pan from the oven, and discard the stems of the thyme and cooked pieces of lemon. Leave the garlic cloves. Cut the butter into small pieces and add it to the pan right into the juice. 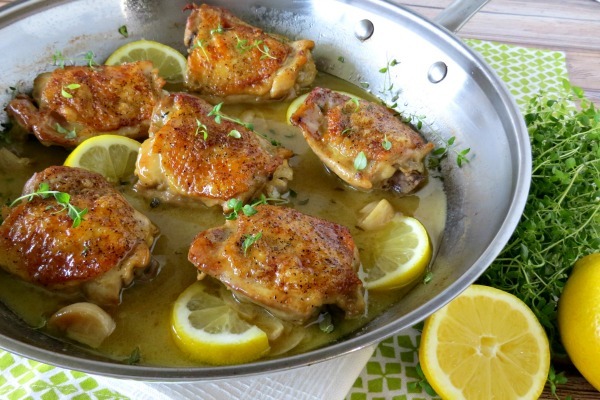 Pour the lemon juice into the pan, and gently shake the pan to incorporate the butter and lemon into the sauce. Remove the leaves from the remaining sprigs of thyme and sprinkle them all over the chicken. If desired, you can add the remaining lemon wedges to the pan before serving like we did. We like to serve this rustic-style right from the pan. The juice is delicious over rice pilaf or buttered orzo. This sounds extremely appetizing! It’s not too heavy and not too light either. Perfect for dinner without feeling overly full afterwards or bogged down. Thanks for linking up with Delicious Dishes Recipe Party! This dish sounds wonderful! My husband and kids love the thighs. I’ll give your recipe a try. Thanks so much for sharing it with us at Merry Monday. Chicken and lemon are two of my favorites. I have to try this.